A few years ago, during a tour of the UK, I stopped for lunch in Nantwich on my way between Manchester and Birmingham. I’d never been there before, only vaguely heard of it, and definitely couldn’t have placed it on the map. And I can’t think of any other reason I’d end up there. It’s not the kind of place you’d make a special trip to see. Unless you have friends or family there, or a particular interest in England’s medieval salt industry, you’re unlikely ever to go there. But I have very fond memories of the town. I spent an hour or so wandering among half-timbered buildings (though admittedly most of the shops at street level were the same ones you’ll find in every single town in the UK), found a cake shop, and ate my lunch sitting on a park bench in the main square, chatting to an old man who had been a semi-professional cyclist in his youth. I’ll probably never go back, but I’m awfully glad I got to see it once. This is one of the many reasons I love to travel by bike. The world is full of Nantwiches – small or medium-sized towns in between the big cities and other flashy landmarks, that aren’t remarkable enough to feature in the guidebooks, but are nonetheless extremely pleasant places to spend an afternoon, or just to sit and eat your lunch. If you were following a pre-planned route via motorways or railways, you’d probably never know they existed. After I was held up by bad weather in Slovenia, I ended up with just two days to get from the country’s northern border, across the Julian Alps to the Aegean, where I was meeting a friend in Trieste. But, having just come from Germany, where a day’s ride will take you perhaps two centimetres across the map, I misjudged the size of the country, and by the end of the first day, was only about 40km from the airport. The small local campsite I stayed in was deserted and the wash blocks were locked, so I felt no guilt in sneaking off without paying at 6am and heading down the river to Gorizia for my morning coffee. Gorizia turned out to be another Nantwich. 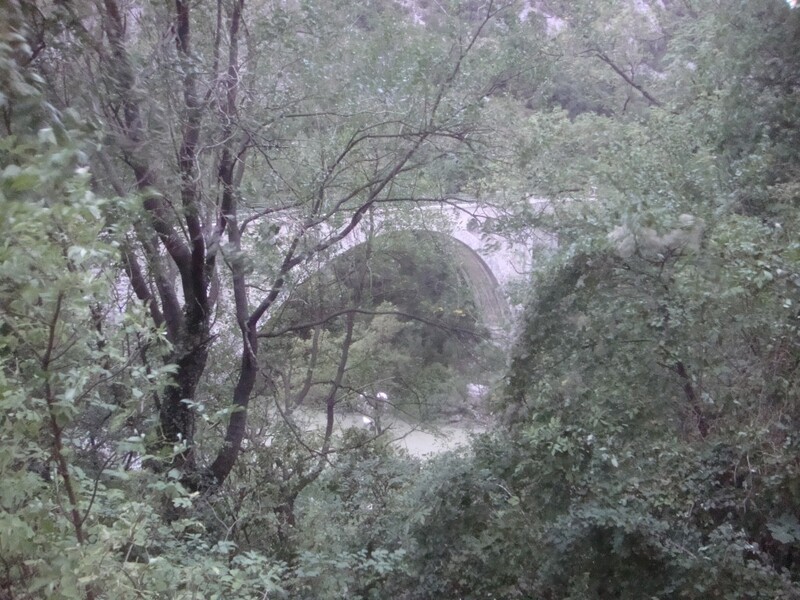 As I neared the town’s outskirts I glimpsed an enormous stone bridge through the trees in the early morning twilight. A roadside plaque informed me this was the Solkan Bridge – the longest stone arch in the world. And Gorizia itself, just into Italy, turned out to exist side by side with the Slovenian city of Nova Gorica – or rather, back to back, since the two towns seem barely to acknowledge each other’s existence, despite their proximity, rather like a couple who have quarrelled in bed and turned their backs on each other. I arrived just as the sunrise was setting the clouds on fire, and rolled past the casinos and concrete shopping precincts of Nova Gorica, wondering why there were no road signs for Gorizia, and whether I should stop at one of the many little Slovenian bakeries that were just opening up for the day, since my stomach was already growling with hunger – and then I crossed some railway tracks, passed an unobtrusive and partially hidden sign welcoming me to Italy, and suddenly I was in a completely different city. Nova Gorica had been pedestrian, functional and fairly unattractive – Gorizia, only metres away, was an charming quasi-Mediterranean metropolis of tree-lined avenues, quaint shuttered houses with red-tiled roofs and little cobbled squares, which the pale early morning sunshine was just beginning to illuminate. I leaned my heavy bike against the window of a dress shop, assuming that, since it was Sunday, it wouldn’t be opening and no one would object, and bought myself an espresso in the tiny cafe. The only other customers were two old men, reading the papers at separate tables, and a well-dressed young couple of about my own age, sitting in the centre of the room and never taking their eyes off the rugby match that was playing on a screen in the corner. I spent a couple of hours there, warming up, glancing curiously at the rugby, sipping my coffee and writing my diary, then had a quick wash in the bathroom and headed out to explore the town. It has a castle on top of a hill, from which I admired the town, the rolling Italian hills and the massive snowy buttresses of the Alps rearing up behind them. And it seems to be the world capital of sausage dogs. I have never seen so many in one place before. For most of the afternoon I sat on a park bench with my tent spread out to dry on the grass behind me, reading Jan Morris’s Trieste, daydreaming, writing letters, and admiring the war memorial in front of me. It was superb. 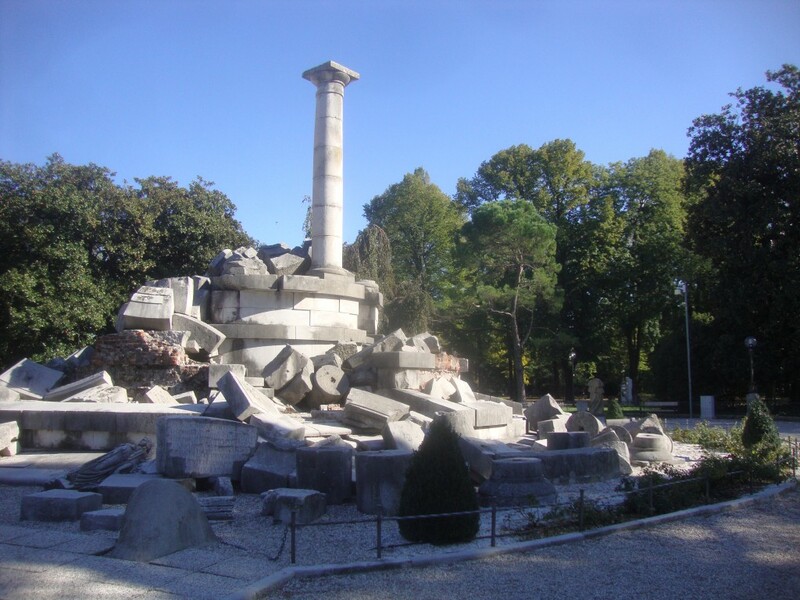 I have never seen a monument that so aptly portrays the ruin and devastation of war. And had I not had a day to kill in Gorizia, I’d never have seen it. I stumbled across another Nantwich earlier this week. I’d arranged to meet my sister in Goreme on the 12th, and had at least a week to cover a distance I knew would only take me three days. So I hung around in Ankara for longer than I’d planned to, enjoying people’s hospitality and revelling in its grey, rainy bustle, that made me feel closer to London than I had since I left it three months ago, and then set off with four days to spare, reasoning that I might as well get there one night ahead of her. 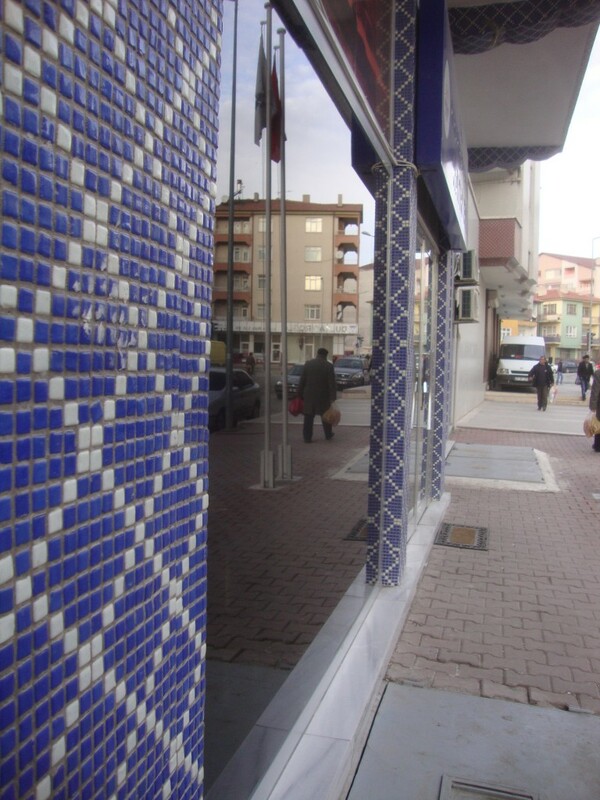 But, once again proving my maxim that a journey will always expand to fill the time allotted to it, I was unexpectedly – but very happily – delayed for a day in Kırşehir in Central Turkey. There’s apparently nothing remarkable about Kırşehir. It’s had a university for about the past four years, but because the town’s considered the back end of nowhere, research assistants like my host, Kahraman, have to be bribed with extra-high salaries to come and work there, and all the student grumble about the lack of bars, nightlife, and any sort of social scene. A sizeable proportion of the town’s youth escape to Ankara whenever they get the chance. And yet I had a lovely time there. Admittedly this was partially due to Kahraman’s excellent hospitality and superb cooking. But I spent a very happy afternoon pottering around the local bazaar, which was piled high with apples of every conceivable colour and variety, and wandered the streets for several hours, trying to put my finger on what I found so pleasant about the town. It’s not especially beautiful or even that characterful. A lot of the older buildings have been torn down in recent years, and replaced with modern tower blocks. 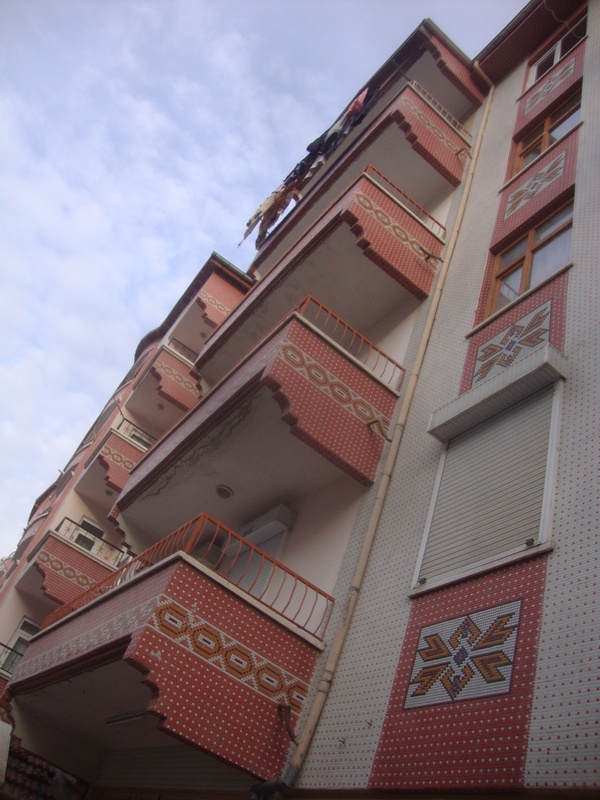 But unlike the concrete monstrosities of post-Soviet Europe, these are covered in thousands of tiny mosaic tiles, which glittered in the thin winter sunlight, and filled the streets with colour. 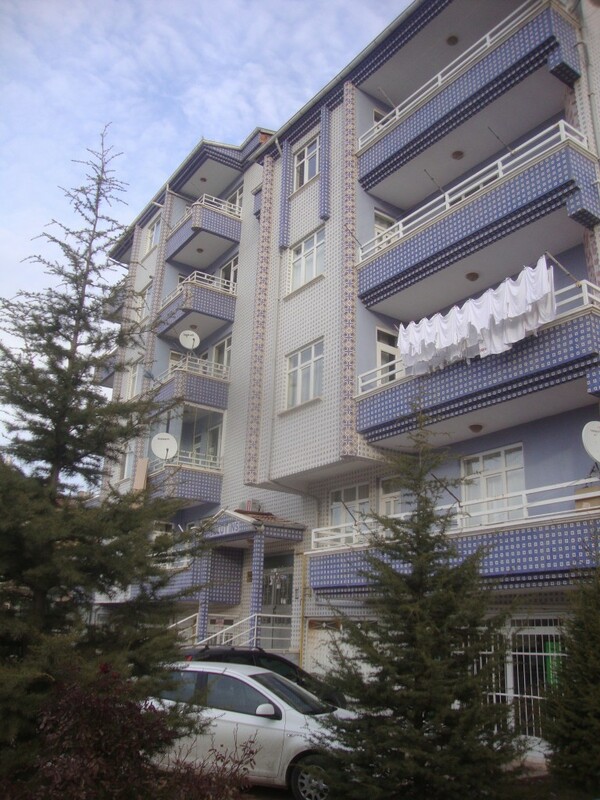 As with Nantwich and Gorizia, I’ll probably never go back to Kırşehir. Kahraman and his friends assured me solemnly that if they’re still in this dead-end town in five years’ time, I have their permission to shoot them. So I’m lucky I got to see it when I did.